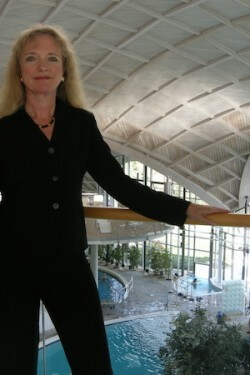 Marion Schneider is the co-owner and CEO of Toskanaworld with its Hotel an der Therme Bad Sulza, Hotel Resort Schloss Auerstedt, Hotel an der Therme Hotel Bad Orb and Klinikzentrum Bad Sulza. She is the CEO of Toskana Therme Bad Sulza, Bad Schandau and Bad Orb, with its unique Liquid Sound. Together with Micky Remann she owns TTS Product & Service GmbH. Ms. Schneider is Director of the non profit organization Ourchild Bad Sulza. She is a speaker co-founder of the state-approved School for Physical and Massage Therapists in Bad Sulza, advisory board member of the American Spa Therapy and Education Certification Council (ASTECC) in Florida, and the Corporate Health Improvement Program(CHIP) of the University of Arizona. Member of Advisory Board of Global Health Institute at Mel and Enid Zuckerman College of Public Health at the University of Arizona. Marion Schneider’s personal goal is the promotion of preventative and rehabilitative therapies as a key role in medicine and politics, as this is not only socially but also economically meaningful and necessary. This is the mission of her daily work and for this she also publishes articles, lectures and contributes at conferences and congresses. Moreover, she is always seeking for effective and helpful therapies to treat chronic and acute diseases and enhance “Health and Happiness”, the motto of the Toskanaworld Group. Download images in high resolution.